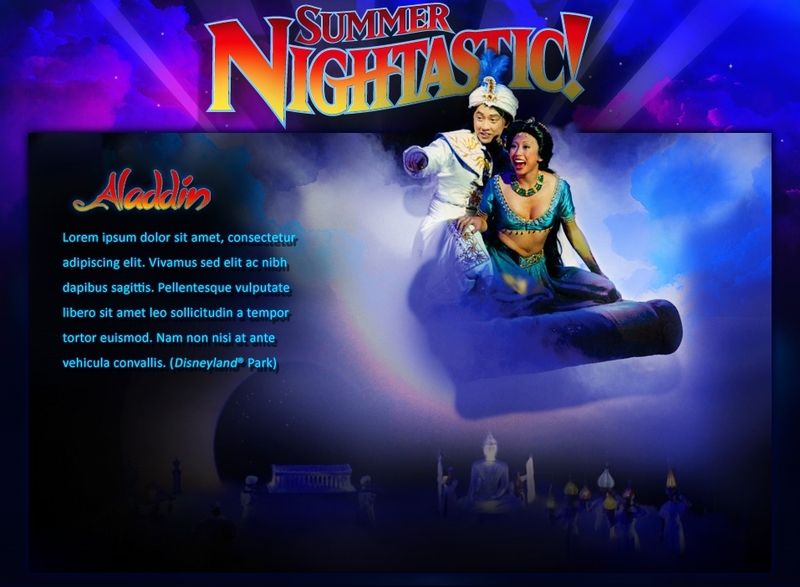 Full Flash minisite used to promote Disneyland's Summer Nightastic event. I was the Flash Lead and main Flash Designer on the project. I designed the site refresh to incorporate a 3D holographic effect using a technology called ChromaDepth that uses the site's color spectrum and refracturing of light / dark (they're called CyberHolograms). Encoding in a CyberHologram reconstructs the holographic information from binocular viewpoints. The result is a 'spectrally addressed binocular viewpoint hologram with retrograde parallax'. The Nightastic event was the perfect medium to use this effect based off it's already slightly neon colors and nightime hours. Unfortunately, you'll need special prismatic glasses to see the effect. You can see the site also functions normally without using any special glasses. There also was some complexity having to add geo targeting for Special Offers, multiple languages and deep linking. 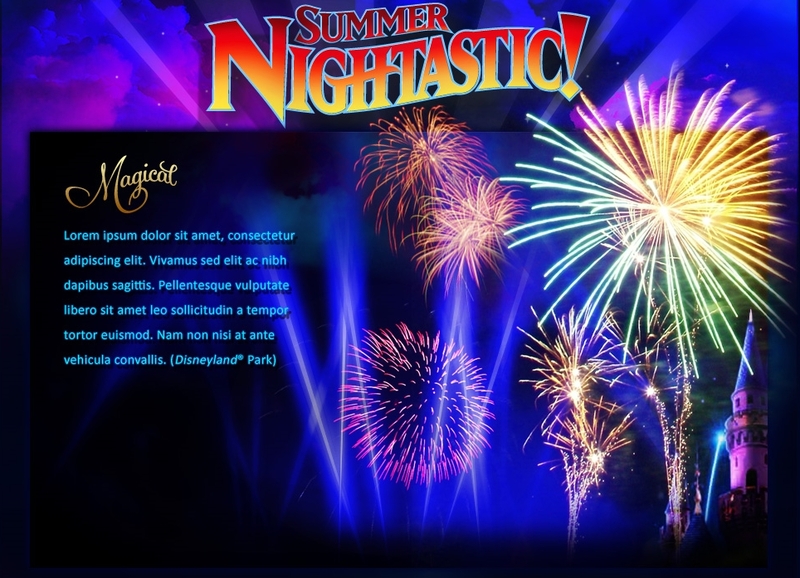 Develop new content for the Summer Nightastic minisite in a condensed time span. My role was to build upon the existing framework, make the site look fresh, introduce new attractions including the new World of Color Spectacular & new Toy Story Mania game, design a new navigational system and build multiple detail pages. We also had to integrate multiple languages, tracking and geo targeting for special offers. 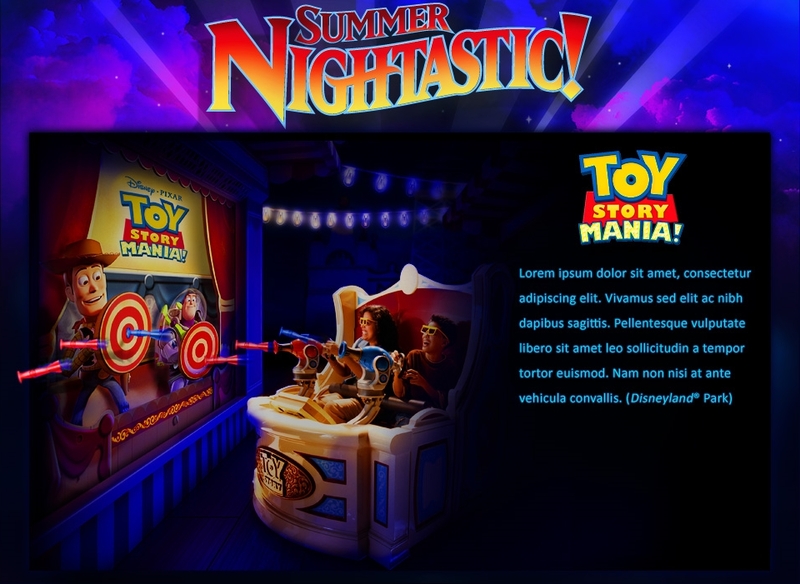 I designed a new carousel navigation highlighting the Nightastic events and redesigned the minisite to incorporate the new 3D/Holographic look. I was able to master the effect by implementing a set of rules and guidelines to assist in choosing the right background and palette to achieve the desired holographic effect. 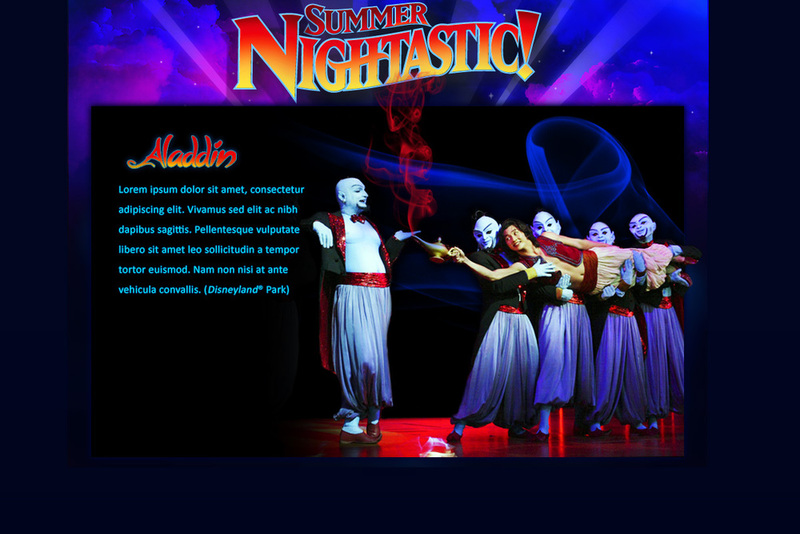 I also designed new Summer event detail pages, special offer pages, promos and small ambient animations. The Disney executives loved the new direction and results. Hopefully this project has opened the gateway to some exciting work in the near future. "These clear micro-optics actually 'play' the hologram into your eyes! What you see is a true holographic image floating on your monitor."